Why can't people drink seawater? My uncle's house was swallowed by a sinkhole! How can water be flowing out of a hill? Tidal Marshland in the Plum Island Estuary, Massachusetts. These marshes might submerge during the next century under some projections of sea-level rise. Wetlands are transitional areas, sandwiched between permanently flooded deepwater environments and well-drained uplands. They include mangroves, marshes (salt, brackish, intermediate, and fresh), swamps, forested wetlands, bogs, wet prairies, prairie potholes, and vernal pools. They often contain more plants and animals and produce more organic material than either the adjacent water or land areas. Wetlands are among the most productive habitats on earth, providing shelter and nursery areas for commercially and recreationally important animals like fish and shellfish, as well as providing wintering grounds for migrating birds. 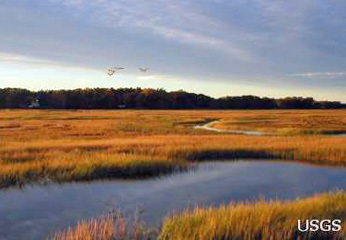 Coastal marshes are particularly valuable for preventing loss of life and property by moderating extreme floods and buffering the land from storms; they also form natural reservoirs and help maintain desirable water quality. Aquatic habitats like those along the Gulf of Mexico are vital to seabirds, fish, and shellfish; economically, the Gulf area alone contributes billions to the economy of the National annually. Riverine deep water, like the Mississippi River and its many channels, is not only essential for navigation, industry, and recreation and therefore responsible for billions of dollars to the economy, but is also invaluable for natural resources. Songbirds and waterfowl use rivers as migratory guides, and rivers and lakes are both essential to countless species of fish, amphibians like frogs and salamanders, and reptiles like turtles, snakes, and alligators.